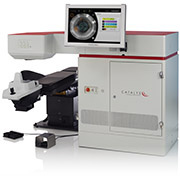 Using the CATALYS Laser system your surgeon can create laser precise incisions, including a circular opening in the lens capsule to access and remove the cataract. Incisions in the cornea can be helpful in reducing the need for astigmatism correction with glasses after surgery. Furthermore, the ability to create a perfectly round and central opening in the lens capsule can improve post-operative visual results, particularly in the setting of premium implants. Your surgeon can use the laser to soften the hard cataract allowing it to be removed gently. If you desire to see well without glasses or contacts after surgery your surgeon may recommend a tailored treatment. This system may not be for everyone such as persons with pre-existing corneal problems or eye implants. Patients must be able to lie flat on their backs and motionless during the procedure. If you are interested whether Laser Assisted Surgery may be correct for you please contact us at Eye Care & Surgery.